A recent trawl through our kit list turned to a nostalgic chat about the one camera in our cupboard which helped us make the step from one-man-band filmmaker to the Content Agency we are today - The trusty Canon 5D MkII. Anyone with the slightest interest in filmmaking and photography over the past 10 years will understand the game changer that this camera was. The 1080p quality, with a glorious full frame sensor, offered us all cinematic look on a budget. When the 5D came onto the market I was a lone filmmaker. Eager to learn and armed with plenty of ambition I had been plying my trade with a Sony FX1. The 5D changed it all though. My modest client list was mostly based in tourism, events and outdoor pursuits, and my new-found ability to offer intimate interviews in shallow depth of field with lovely panoramas sent them wild! I remember my first shoot with the 5D. My budget had stretched to the new camera, but only to only one lens - the 50mm 1.4 Zeiss. However, that was all that I needed and with it I produced a wee tourist promo which (at the time) I was very excited about. It really changed everything about my own style of filmmaking and shooting. Unfortunately, the film isn't online these days (if you know, you know) but take my word for it! Undoubtedly my favourite memories with the camera came from an early shoot with Danny Macaskill. It was 2011 (otherwise known as ‘the good old days’) and we’d been asked by Channel 4 to shoot a short film to feature in a documentary about ‘urban athletes’. By that point I’d upgraded to three lenses and I joined Danny and our friend Nash in a Travelodge for a week, working in a cool little abandoned train yard to make the film. Danny wore the same T-shirt every day to ride (it smelled so bad by the end!) and my kit list consisted of the 5D, a tripod, mini jib, slider and 24mm, 50mm, 135mm lenses. This gear produced a film that to this day remains my favourite piece of work. While the landscape shots were beautiful, the 5D also enabled cinematographers on a budget to capture an extremely shallow depth of field. It was something I loved so much about the camera. It was beautiful, a novelty, and I may have taken it a bit far sometimes! Here's a little doc we shot with Guy Martin in 2012 at Orange Bikes. 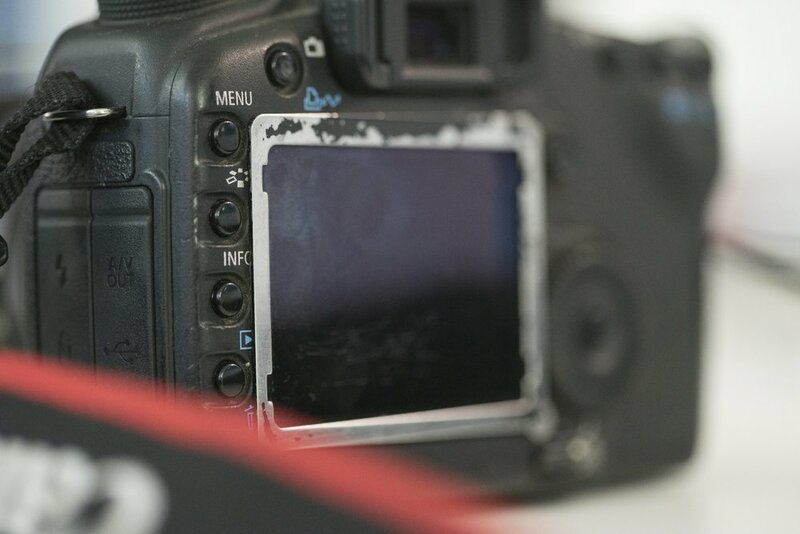 The camera was brand new in 2010 and 8 years later this wee 5D has seen a lot - it’s had a tough life but what a trooper! It’s been dropped, kicked, frozen and soaked but all in aid of good times and good work. It’s grown with us all at Cut Media and it's been on so many of our defining shoots. To this day the 5D still sits on our kit shelf being picked out to use for BTS shots occasionally.